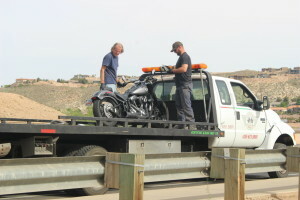 ST. GEORGE – Drivers pulling out in front of motorcycles caused two separate crashes across town in St. George Wednesday. Around 5:22 p.m, a motorcyclist eastbound on Sunset Boulevard moved into the middle lane to turn left onto 1100 West where the rider waited for a break in traffic. At the same time, the driver of a blue Hyundai passenger car was stopped at 1100 West and also waiting for a gap in traffic so she could turn onto Sunset Boulevard, St. George Police officer Lona Trombley said. When the gap in traffic opened up, both the Hyundai and motorcyclist started moving. The Hyundai turned out in front of the motorcycle and in order to avoid it the motorcyclist ended up crashing by laying his bike on its side. The woman in the Hyundai told police she didn’t see the motorcycle when preparing to make the turn. When the gap in traffic appeared, she said, she decided to go and didn’t notice the motorcycle or its rider until both were on the ground. The motorcycle rider sustained some minor cuts and abrasions to his side, Trombley said, and was taken to Dixie Regional Medical Center in St. George by Gold Cross Ambulance for examination. The Hyundai’s driver was cited for failure to yield. An hour prior to the incident on Sunset Boulevard, around 4:15 p.m., a man on a motorcycle southbound on River Road between Riverside Drive and 1450 South also crashed. In this instance, a tan SUV pulled out of a parking lot and right into the motorcycle’s path. As in the Sunset Boulevard incident, the rider ended up laying his motorcycle down on the road. The motorcycle ended up skidding about 100 feet before coming to a stop, Trombley said. The rider received road rash on his arms and legs yet wasn’t immediately taken to the hospital. The incident temporarily backed up southbound traffic on River Road until it was cleared. The tan SUV didn’t stop and police were unable to locate it at the time. No physical contact was made between the motorcycles and the vehicles in the incidents. Darn! No one got the tan SUV’s ID. it’s touch and go in a car, especially in certain areas. Sunset being one of them. You will probably do best on a mc if you pretend you’re invisible. How many times do you see mc riders weave in and out of traffic ‘because they can’? Maybe the driver whipped around another car and punched it, then didn’t have time to stop. It’s happened to me- almost getting hit by a rider that was too busy weaving and racing to notice there was a car already in the lane. And yes, dotboy, I saw him. One guy is alive today only because I chose to ride along the shoulder instead of running him over with the rear wheel when he decided to swing into the merging lane (right side passing) to get around a car.